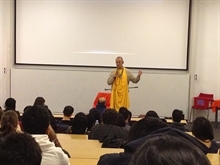 On Thurs 29 Nov 2012 Warwick University was fortunate to have ISKCON initiating Sanyasi Guru give a talk on 'The Meaning of Life' to around 100 inquisitive students. The evening started off with an enlivening presentation on the topic and an introduction on Maharaj’s life and projects by Gurusevak Das (ISKCON Coventry youth leader). HH Sivaram Maharaj then went on giving a fantastic well-presented Vedic, scientific & logical presentation on the Meaning of Life to eager students who attended from Warwick, Aston, Birmingham & Coventry Universities. Maharaj encouraged an interactive questions and answers session during the talk which stirred many minds. On conclusion of the talk Maharaj sang a sweet Maha Mantra kirtan alongside students accompanying on instruments and involved all the students in hearing the chanting of the holy name. Full Prasad was distributed to all and students stayed on taking away signed copies by Maharaj of Bhagavad Gita which were gifted to them for free by Warwick Ksoc. 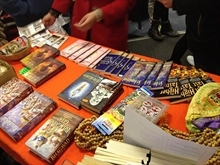 A book stall was set up from where students bought many of Srila Prabhupäda’s small books, bead bags and chanting beads and from the evening 22 Bhagavad Gita were taken home by students enthused to read! In total from preaching at Warwick Ksoc a total of 42 Bhagavad Gitas have been distributed in Term 1 alone which is a phenomenal achievement and students from warwick university regularly attend Sunday Programs at the temple. All in all it was a fantastic event and an amazing turnout thanks to the excellent promotion and advertising by the Warwick Ksoc Exec. The audio recording of the event will be available in our audio section by this week and photos of the event are posted in the gallery!